Gabby Douglas won a gold medal in the women's gymnastics individual all-around, she became only the fourth American to do so in the history of the Olympics. That's not all: as one earnest broadcaster pointed out, she was also the first "African-American" to become president do it. Next Siri Goes on Safari! There is a competition, however, in which Gabby Douglas won't be finishing first. I'm talking, of course, about her race to be the first gymnast name-checked in a rap song. 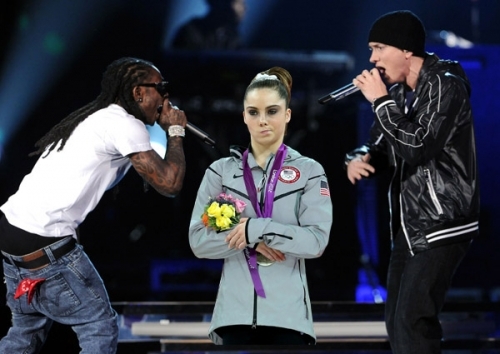 In the thirty-plus-year-old sport that is hip-hop, she's not even on the podium. The strange love affair between the lithe, balletic enterprise of women's gymnastics and the scowling, macho theater of rap begins in 1991, when Nadia Comaneci won the title of first gymnast mentioned in a major rap recording. A minute into his track "The One," Chubb Rock twerks the Romanian gold medalist's last name to serve as the climactic punctuation to the following rhyme: "For each I'm gonna reach, impeach with the speech. / If you riff, I'm gonna flip like NA-dee-ya CO-ma-neech." The syllabic roll of this lyric is not unlike a rapid coast-to-coast floor tumbling routine, in which Chubb, gaining momentum from a string of rhyming "-each" syllables, gets air off the internal rhyme of "riff" and "flip," tucking the double-somersault earthward, with a half-twist at the multisyllabic foreign name: a stuck rap landing if there ever was one. Seven years after Nadia Comaneci's name-check (and a few years after Big Daddy Kane dropped the helpful, if name-check-free, "Lyrical Gymnastics"), an American was finally awarded one. This time, it went toMary Lou Retton, who tumbled briefly through A Tribe Called Quest's 1998 song "Da Booty": "Half of y'all claim dog, but meow like kittens / Flippin on brothers just like Mary Lou Retton." Note the repeated use of "flip." As the Tribe and Chubb Rock lyrics demonstrate, the longevity of hip-hop's relationship with gymnastics owes a great deal to that dexterous verb, which in both instances means "to somersault" and "to upstage lyrically." In later years, rap similes that hinged on "flip" would come more and more to refer to drug-reselling (triple beams rather than balance beams), as in Styles P.'s now legendary line on Rick Ross's "B.M.F. ": "Coke is like a mattress in the hood / I'm flipping on it." The late 90s saw a marked increase in the number of gymnastics reference owing almost entirely to one woman: Dominique Dawes. Before Dawes, gymnastics name-checks were notable for their slow turnaround time: Chubb's Comaneci mention came fifteen years after her gold medal, and Q-Tip's Retton shout-out was fourteen years after the fact. There was almost an implied "Remember her?" factor in both. But with Dawes, songs and freestyles citing her started appearing within a year or two of the 1996 Atlanta Olympic Games, where she was part of the first American team to win the Olympics all-around gold medal. Everyone from Capone N Noreaga to Tha Alkaholiks name-checked her. Several factors were at play: the birth of Internet culture; the fact that the Games in which Dawes competed were held in America, in 1990s Atlanta no less (the epicenter of black music at the time); and that Dawes was African-American. Of course, it didn't hurt that Dawes was also, to use a scrupulous Olympics-based scoring system, a dime, the underground rapper Bumpy Knuckles going as far as to admit that he "wouldn't mind getting in them draw's" ("Devious Minds," 1999). One can imagine a near-future scene: having tweeted that he was glad to have "lived to see what Gabby Douglas did in the Olympics," Lil Wayne walks over to his bookshelf, cracks open his dog-eared rhyming dictionary (cabbie, flabby, tabby...) and starts flipping the lines over in his mind.